I need some kind of advice. My FPGA dev-cart needs M2 signal for clocking internal circuitries, but also for decoding accessess to $6000-$7fff (and also $4000-$5fff as some mappers, eg. mapper 90 uses this). so M2 transitions need to be delayed by that time. because only rising edges on M2 need to be delayed. That is because all data & address latching into FPGA on CPU writes occurs at falling edge of M2, because that is the time the data is valid (at rising edge of m2 data is not valid). Anyway, never mind. What does that mean? 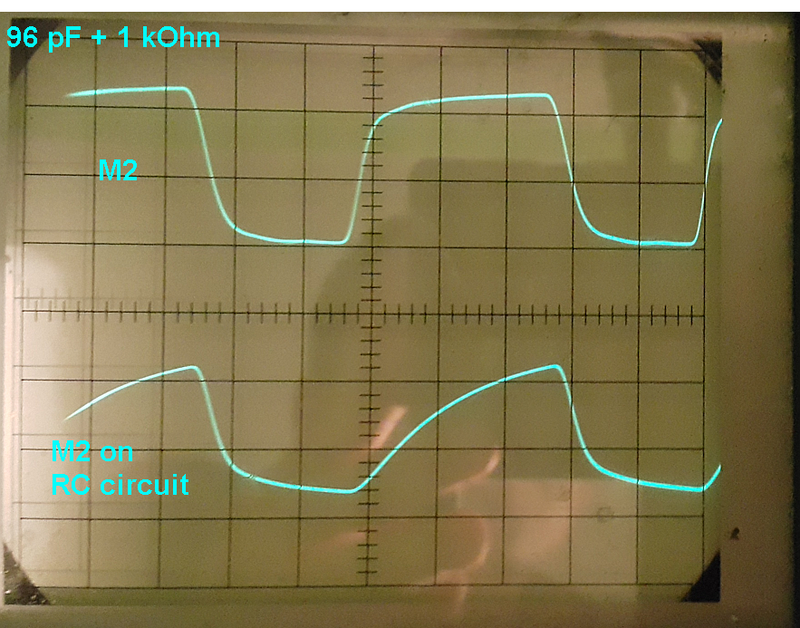 With R*C = 1 kOhm * 28 pF the rising time at its slowest point is around 9 ns/V which is OK - and the output signal is OK. When I increase C to 96 pF, the rising time becomes 32 ns which is too much. Too slow rising time makes various metastable states inside the 74lvc245 which makes its output behave weird - probably quick glitches are observed. 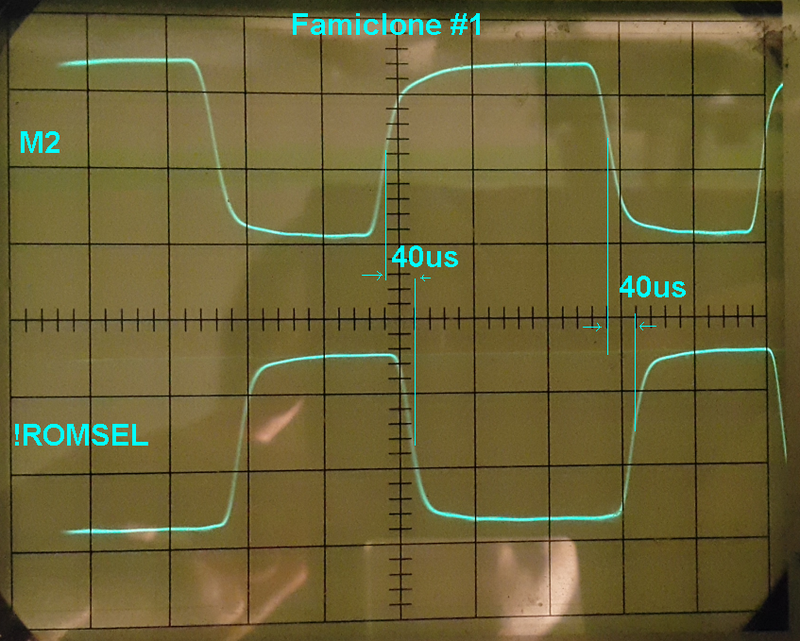 Neither my analog scope nor my logic analyzer was able to see those glitches, but when I clock my FPGA with that signal, it detect those glitches. 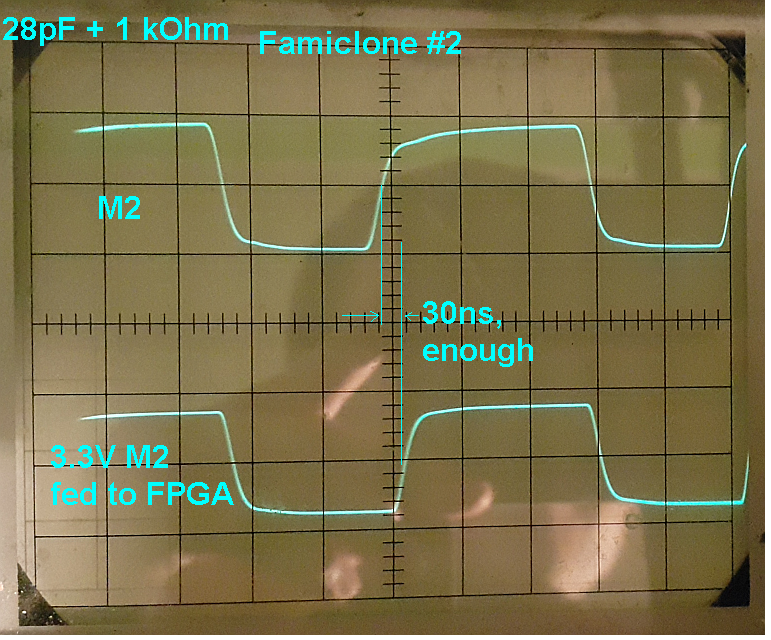 For exaample - when I clock my FPGA with that signal and I force it to change output signal on each of clock rising edge, I got something like that, instead of just M2 x 2. First - I tested with 28 pF. And just for curiosity - shape of M2 on RC circuit when 96 pF. 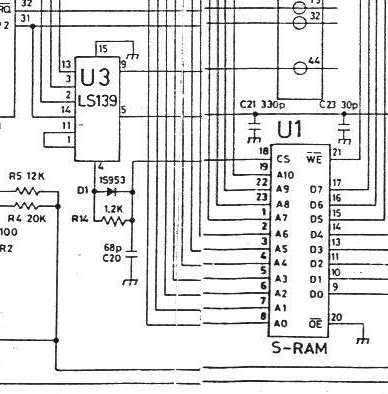 First solution would be just fed to FPGA two signals - one not delayed M2 for clocking purposes, and secod glitched and delayed M2 for restoring A15 and thus decoding PRG-RAM, etc. 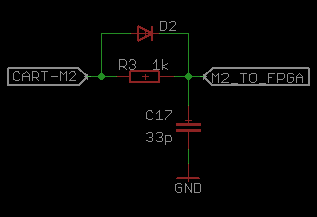 Second solution is to use schmitt on delayed M2 signal, before puting in on 74lvc245, but i dont want to use additional chips. 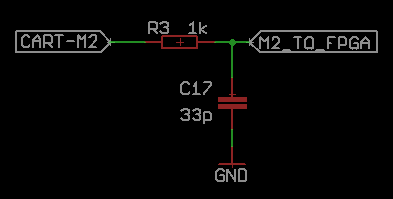 The FPGA has built-in schmitt trigger inputs, but it's useless at this purpuse because signal on 74lvc245 is not slow rising, but glitched. 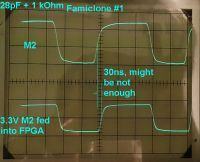 Do you have any other idea how to use just one delayed M2 for all purposes in FPGA? 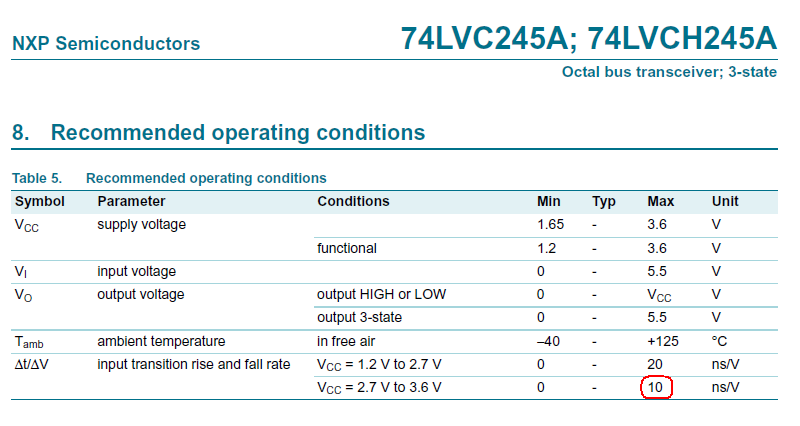 Couldn't you put the generation of the delayed copy of M2 after the 3V logic-level conversion? 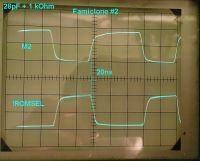 Or use a nMOSFET clamp for just the delayed copy instead of a '245? Perhaps a little dirty, but it's worked for me. 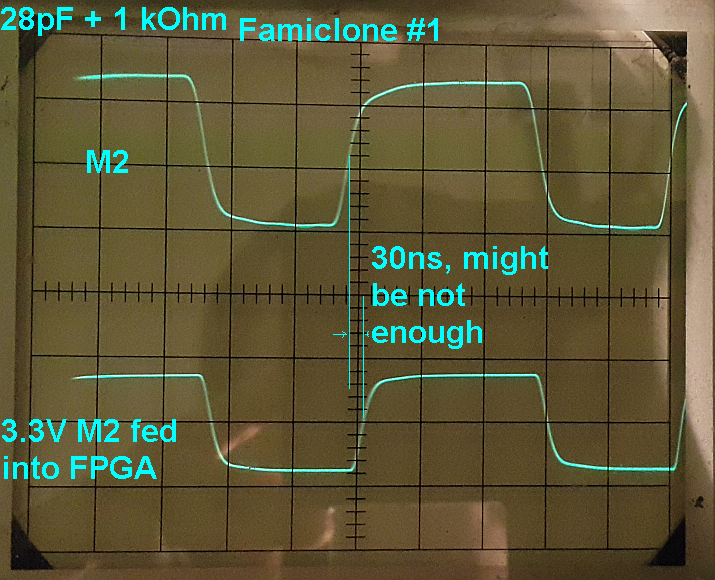 If you're only combating corrupted PRG-RAM, you can remove glitch enables by adding extra capacitive load to the sram /CE line. The cap value depends on your output driver strength. I've had success with 1nF on multiple CPLDs. 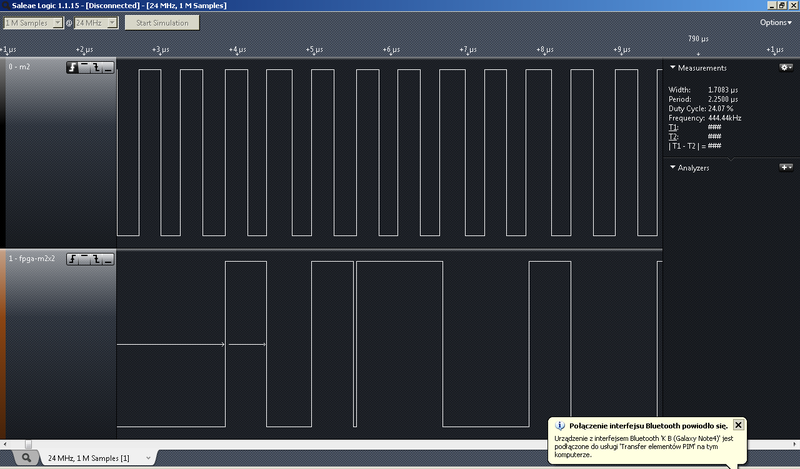 Of course that doesn't work if you have registers internal to the CPLD/FPGA that you're trying to deconflict. 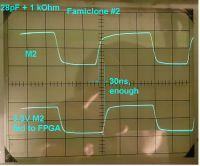 I think the best solution is digital filtering/delaying of M2 internal to the FPGA itself. This of course requires that you have some logic to spare, and a decently high speed clock at your disposal however. I do not see why it would be required to delay M2. 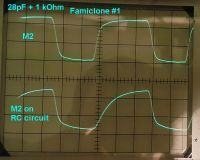 I might be wrong, but if you're decoding circuit for SRAM at $6000-$7FFF for example, using M2 directly should work fine. ... because M2 rises before /ROMSEL falls, any read or write from $E000-$FFFF looks like a read or write from $6000-$7FFF for the few tens of ns between the two edges. Thank you, I think that's the best idea. 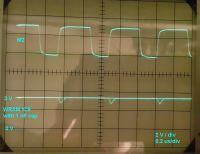 The FPGA internal Schmitt Trigger input should do the job. All combinatorial logic involving M2 & !ROMSEL will of course be not right, but the only place it is used is really for generating !PRG_CE. Adding additional capacity as you said will delay falling (and rising edge) and thus RAM will probably behave properly. 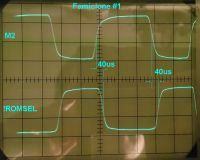 I did it in my very first flash-cart, but it was clocked by external 100 MHz generator. 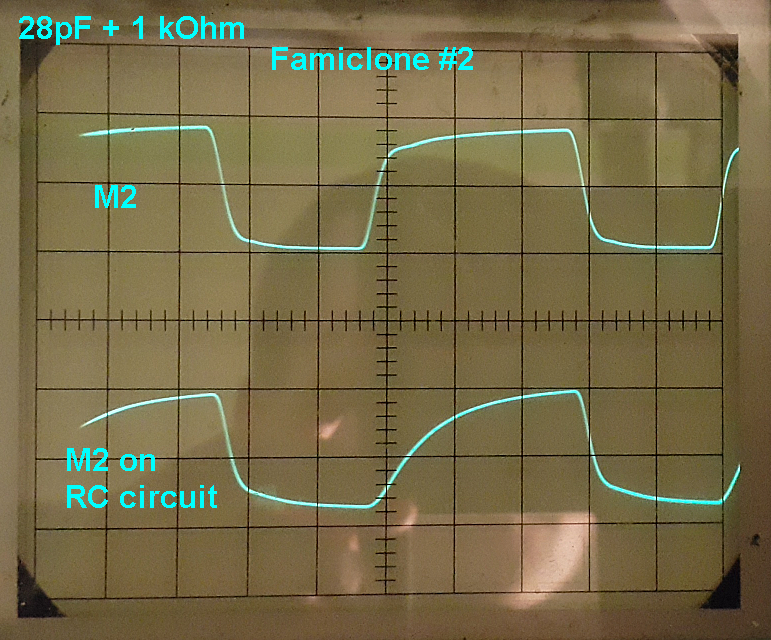 I replaced the R+C+diode circuit with ordinary jumper and just added 1nf between WRAM-!CS and ground. 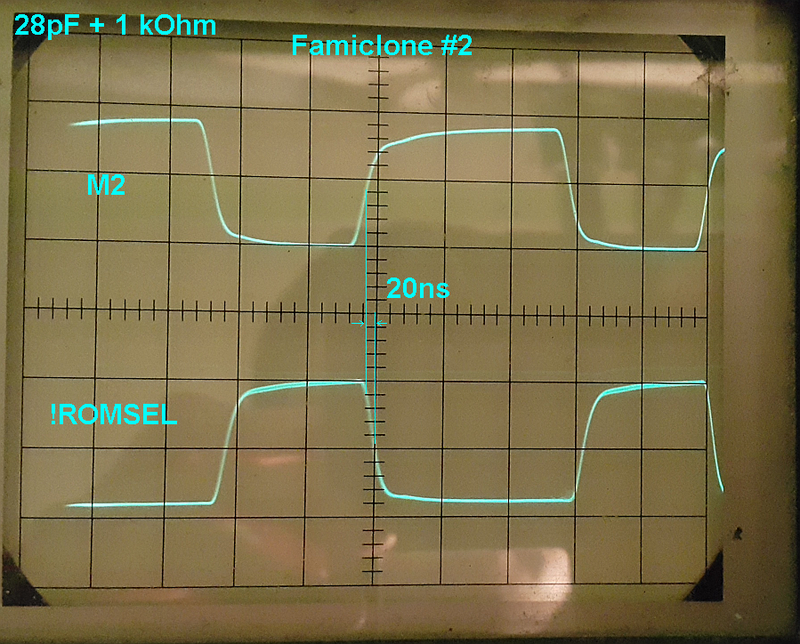 No software modification was needed, everything works just fine - tested on dozen different famiclones, every single one works perfect. 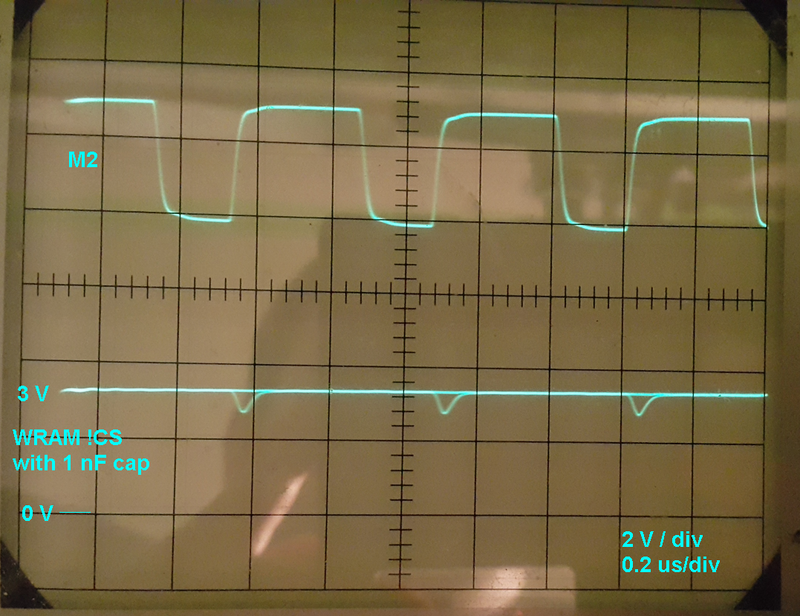 Removing R+C+diode made the clock circuit very stable, and now detecting A12 rises (MMC3) works just perfect and there is completely no shake at statusbar in any game. 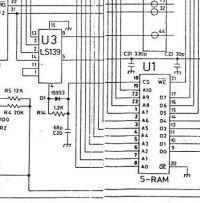 Clock circuit also is used for MMC1 to disable successive writes - it is also working without problems (thats how I found out that something is wrong - couple MMC1 games were not working right). I can recommend good game for testing WRAM - Kid Icarus, because it writes non stop to E000-FFFF in order to switch banks and also uses SRAM at 6000-7FFF non stop. Single corruption makes this game hangs. Also for those that don't believe that the WRAM corruption problem occurs - it does. My cartridge's menu was using 6000-7FFF as read buffer from SD card. 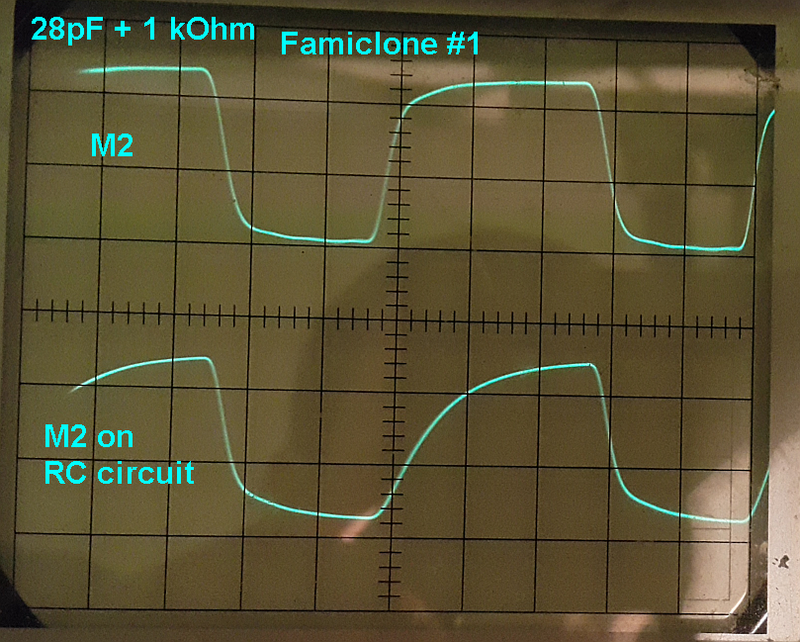 When no 1 nf cap at SRAM !CE / no M2 delay circuitry was present, some letters in filenames read from SD card were overwritten. 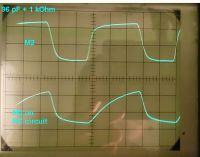 Here is waveform of SRAM-!CE after adding 1nF cap - the spike is minimal and RAM does not react on it.